For the first time ever, astronomers have detected a pair of supermassive black holes at the center of an inactive galaxy. The unique objects were discovered because they ripped apart a star when the ESA's observatory just happened to be looking in the right direction. In an active galaxy, black holes are continuously fed by gas cloud, but in an ordinary inactive galaxy, or quiescent galaxy, black holes are fueled by tidal disruption events that occur sporadically and are impossible to predict. Finding black holes in quiescent galaxies is difficult because there are no gas clouds feeding the black holes, so the cores of these galaxies are truly dark. So to detect them, astronomers need a ton of luck; they basically have to wait for an occurrence called a tidal disruption event. In this case, such an event occurred as a star was pulled apart by the gravity of the black hole, resulting in a burst of X-rays. It was a case of the ESA's XMM-Newton space observatory looking at the right place at the right time. 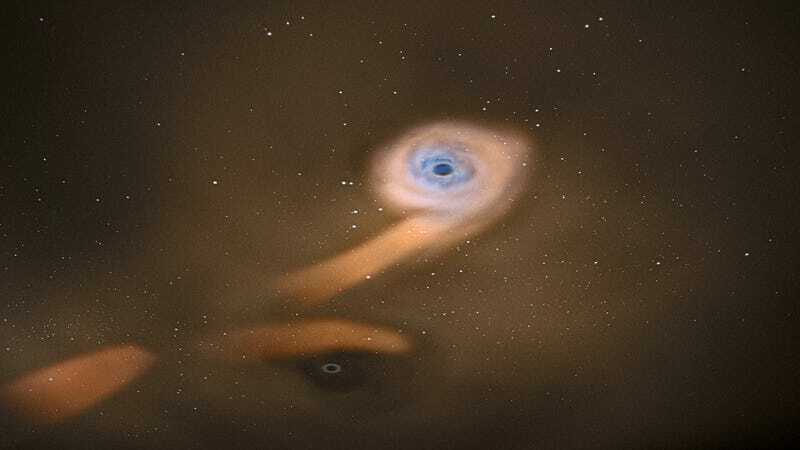 Models show one of two possible configurations: Either the primary black hole weighs as much as 10 million solar masses and is orbited by a black hole of about a million solar masses in an elliptical orbit, or the primary black hole is about a million solar masses and in a circular orbit. The separation between the black holes is quite small: 0.6 milliparsecs, or about 2 thousandths of a light year. That's about the width of our Solar System. Eventually, these two black holes will merge. And when they do so, they'll release a massive burst of energy into the universe (but not primarily in X-rays). The final merger is expected to be the strongest source of gravitational waves in the universe.